Mexican Axolotl or "Mexican walking fish"
The Mexican Axolotl, specific name Ambystoma mexicanum, is a mole salamander belonging to the group Tiger salamander. The Mexican Axolotl is unique in its appearance because this species fails to undergo metamorphosis, meaning the adults are still aquatic and maintain larval traits such as gills. It is also neotenic, meaning that when one body part is destroyed it has the capability to grow another one back. 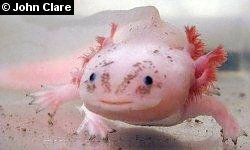 The picture above shows an axolotls that has the mutant gene for albinism. For more information please have a look around the site and any questions or comments can be directed to Britni Osuldsen osuldsen.brit@students.uwlax.edu.